WA Super is a industry super fund, which means any profits made goes straight back to our members in the form of lower fees and better service offerings. 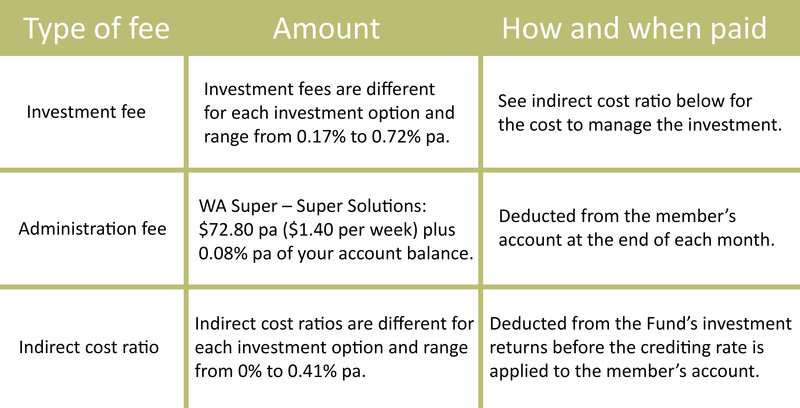 The table below outlines the fees and costs that WA Super charges its members. These fees and costs may be deducted directly from the member’s account, from the returns on investments or from the assets of the superannuation entity as a whole. Please note: the investment fees and costs vary dependent upon which investment option(s) you select. Other fees and costs apply. We recommend that you should read the Product Disclosure Statement.